The Law of Attraction is the most fundamental of all universal laws. Out-pacing the laws of gravity and velocity, well beyond the measurements of science, The Law of Attraction is the basis for who YOU are. For those who are new to conscious thinking, this idea that your thoughts create your reality might be as whimsical as a spotted leopard running free through the city streets. As a crazy notion, a "New Age" scam, even an "airy-fairy" mind twister, the Law of Attraction is not a new idea. This rather fundamental concept has been around for ages, often hidden from the masses by those who wish to keep people "unconscious". For those who have had some experience with this concept, they might find these words refreshing and fulfilling. This idea is not new to them but is a reminder of what they already know. Most of us were taught to be sloppy thinkers. We remain frozen in worry or defeated by fear. We believe that we have become victims of our circumstances. As our thoughts remain negative or mostly unconscious, we end up attracting by default. We are stunned when we develop a horrible disease, become involved in a tragic car accident or suffer from financial failure. Without realizing it, the thoughts we have been thinking are all responsible for this. The ability to focus a thought becomes the driving force behind The Law of Attraction. Focusing on a single thought purely and clearly for a short duration of time becomes the starting point. Once you become adept at focusing your thoughts it will be easier and more efficient. Words do not matter much but the emotion behind the words does. The Universe works on vibration. Everything is vibration first and matter second. When you feel an affirming emotion when focusing thought you are now creating dynamic change. Pure thought with positive emotion is said to be the equivalent of 2000 action hours. The problem that many people run into is that they "pretend" to be positive on the outside but are really vibrating negativity on the inside. They might not even be aware of what it is that they are doing. The Law of Attraction is so powerful that it trumps all other laws and forces in the Universe. It never takes time off or breaks and it is always working. It supersedes science, viruses, bacteria, pathogens, parasites, natural disasters, bad luck, heredity, genetics, chance, random, poor diet, too much sugar, astrology, numerology, tea leaves and psychology. Under The Law of Attraction, there are no odds and statistics are meaningless. Let's say that you desire to have more money. This is a positive thinking manifestation. You are now in a state of creation and allowing. You then might begin to worry about how complicated it will be to have all of this money. You imagine that you won't know how to manage it. Others will want some of it and you might not know how to say "No" to them. Now you are in a state of resistance. Your foot is "sharply pressing down on the brakes" in your "vibrational" world. This is why your creation has not yet arrived. When you are in a state of judgment you are also in a state of resistance. Imagine wanting an expensive new car but you have judgments about those who are able to afford expensive new cars. You are now in a state of resistance. Imagine that you want an easy life where you did not have to work so hard to get by. You keep yourself in a state of resistance when you judge others who already have an easy life where they do not have to work so hard. You can not belong to a club where you despise the current members. If you want your manifestations to arrive you must already be a vibrational match to them. Festering in a state of judgment is just pushing your desires away. Who are you really? An amazing lecture given by Alan Watts, a British philosopher, writer and speaker. He wrote more than 25 books and numerous articles on subjects such as personal identity, the true nature of reality, higher consciousness, meaning of life. You deliberately decide to focus pure and positive thought on something and remove all resistance to its arrival. And, sure enough, it arrives. Your creation might be something as simple as visualizing a parking space opening up for you at the mall. You deliberately intended it, allowed it to come to you and acknowledged it when it arrived. When you get to this point, you do not have to work so hard to create things in your life. You are a believer in how the mind game is played and you spend conscious time each day making your mind important. New creations come to you easily and quickly. You have built a positive ball of energy that continues to roll forward in your favor. People call you the "lucky one". The scientific and rational community have spent an inordinate amount of time and money studying the brain. The belief among these individuals is that the brain is the ultimate part of who we are. They say that the brain controls everything. The mind, according to these scientific types, is just a function of the brain. This is akin to the belief that the brain secretes hormones through the glandular system, establishes electrical impulses through the electrical system and has many more functions. We are told by our scientists that the brain is the most important organ and the mind is just an activity that the brain performs. Nothing could be farther from the truth. The reality is that scientists and rational-minded individuals have it completely backwards. The mind is much bigger than the brain. The mind does not live in the brain but passes through the brain. The mind can pass into the smallest cell in one's body or can travel into the future or across thousands of miles of empty space. Have you ever heard of someone who was "incurably sick" and learns how to focus his mind and heal his body? This happens every day. When you take your thoughts to Aunt Alice, thousands of miles away, and the next thing you know there is a telephone call from her, the brain did not do that. The mind, traveling far outside the body, reached out to make contact. Magic will begin to happen at an even quicker pace when we stop studying the brain (just an organ) and learn how to focus our minds. Scientists and brain researchers are far away from the leading edge of discovery. You cannot study the mind with a microscope, X-Ray, MRI or CAT scan. Using your mind to attract your reality is actually a very simple technique. First, make your thoughts important. Most people randomly shrug off their thoughts as not being important. They often get stuck thinking the same old negative thoughts all day long and cannot begin to see the relationship between what they are thinking and what is happening in their life. You are angry that you have a beat up old car and every day you proclaim how much you despise this car and wish someone would just come along and crash into it to get rid of it. Lo and behold, you are involved in a traffic accident and your car is destroyed. You act surprised when this event transpires and you move into blame and anger. You believe whole-heartedly that it must be the other driver's fault for not paying closer attention. You might have heard stories of how wild animals are attracted to fear so if you are approached by one do not run or act afraid. 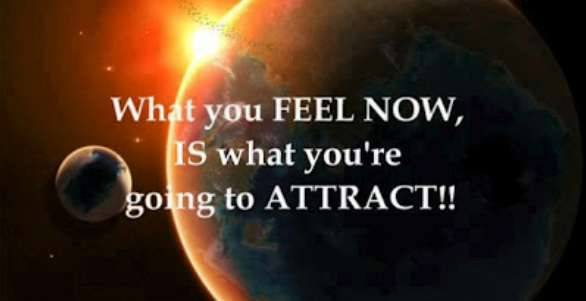 The Law of Attraction works the very same way. If you are afraid of "catching" a horrible disease you are still attracting it to you. If you are afraid of financial failure you are still attracting it. Whatever you are afraid of has a good chance of coming closer to you. This occurs because your thoughts are like magnets, whether those thoughts are positive ones or negative ones. Emotional alignment is important when attracting. Imagine leaving the house feeling like a victim. Why does it surprise you when you spill coffee on yourself? This incidence only matches a vibration that you were already experiencing. Like attracts more of the same. A vibration of negativity will bring more negativity your way whereas a vibrational attitude of positivity will attract positive results. If there were two words that I could eliminate from the English language they would be "victim" and "survivor." You hear these powerful words over and over again, through the media, through "support" groups and from the common person. These two conditions can only exist from someone who is "unconsciously unconscious". This is a person who is not aware of the thoughts that he is thinking and the chaos that he is attracting. There are no "victims" and there are no "survivors". There are only "conscious choosers" or "unconscious choosers". When you become an unconscious chooser you often remain in a state of "blame". This situation occurs where you believe that it is always somebody else's fault that your life is going poorly. For instance, many people continue to blame the "poor economy" for their own lack of financial success. Yet, there are many who are thriving in this "poor economy". Most often these "thrivers" will tell you that they are not interested in listening to the scarcity-minded pundits on television, but choose their own path to prosperity. They are consciously choosing a new way to think and thus have a prosperous lifestyle. They also say that they are not interested in participating in the "down economy". Remaining in blame is just another way of saying that you are not willing to be responsible for the thoughts that you are thinking. Why would someone deliberately choose to develop a horrible disease or choose to have bad things happen to them? This is often a challenging question for many to understand. The answer is very simple. We all have a part of ourselves that is frozen in sabotage. Not everyone wants to feel well or to be wealthy. Most people have invested a great amount of time and thought into sabotage and this is what shows up. You might have heard the expression that says, "if you go looking for trouble then trouble is likely to find you". A parent knows all too well how sabotage works. At one time or another most children will "develop" a cold or sickness to avoid a situation like going to school or visiting a relative. The child's thoughts are powerful enough to change the physical body so the child can escape a situation that he or she does not know how to handle (i.e. a test, a conflict etc.). As adults, our powerful thoughts continue to sabotage our lives, only the outcome is often stronger. From putting on weight to financial hardships, if you are not thriving then your thoughts are actively involved in sabotaging your greatest successes. You have invested in sabotage as the primary reference point in your life. Somehow you errantly believe that you are benefiting from sabotage just like the sick child feels a benefit by not having to attend school. For instance, many people create illnesses to rest, take a break from life, to be taken care of by others or to avoid an uneasy situation. Instead of learning to find the tools to resolve these conflicts, becoming sick is the easiest way to find relief. One could make the argument that hospitals are filled with people who are choosing illness as a way of getting relief from a mental conflict that they are unable to resolve any other way. Yes, your mind is that powerful and there are no exceptions. It might be difficult to understand why a child would choose to get sick and die. What most of us do not realize is that children too are thinking and creating their reality. Whether it is in the womb, infancy or adolescence, a child is still focusing thoughts, either positively or negatively, and is still creating his or her reality. Here is an example of how this works. A story appeared in a local newspaper of a fourteen-year old boy who mysteriously and "accidentally" hung himself while playing on a makeshift backyard rope course that he had built. Most people assumed this to be a horrible accident and a chance of fate. What most people do not realize is the actual story being created by this young boy. Two days before his death the teenager was kicked off the freshman football team at school. He was devastated. He felt his life was over. The expulsion from the team caused him so much despair that he did not believe that he could go on. He felt trapped and helpless and wanted relief from his suffering. His mind created a situation where he would find relief and still save face (his death would look like an accident). While this way of perceiving the world might be difficult to digest for many, when you understand our investment in sabotage things become much clearer. We are all looking for relief from conflict. If we do not believe that we can resolve the conflict externally, we frequently create a situation that resolves itself internally. This is often seen in sports. When an athlete is not performing well or has an off the field conflict, he frequently suffers an injury. While the injury might be real (a pulled hamstring or a stiff back), the mind was busily at work creating the situation. Fans would much more likely support a player if he were injured than if he were having marital problems at home. After all, an athlete is expected to leave his personal issues off the field or court. You do not have to believe in the Law of Attraction for it to be working. Just like you do not have to understand or have knowledge of gravity, it is still working. Step off a balcony of a two storey building and whether you believe in gravity or not, you will most likely still come crashing to the ground. Most people create by default, meaning that they are not aware of what their thoughts are and hence take no responsibility when their manifestations arrive - for better or worse. “You have to learn the rules of the game. And then you have to play better than anyone else”. If you do not learn how to play the game then the game will certainly play you. We are talking about the mind game going on inside of you. When you are an unconscious attractor of your reality you often become a victim and are stuck in blame. This is when the game is playing you. A mind in a state of appreciation is a mind creating positive results. A mind looking for someone or something to blame is a mind creating more sabotage and chaos in one's life. Whether you believe in the Law of Attraction or not, it does not matter. The power of the mind is still at work and the results can still be felt. Don't you think it better to learn how to focus your thoughts and start to receive all of the dreams that you have been asking for?